What happens when you cut a biconvex lens in half? Specifically, does the focal length change? How can this be rationalized? It might help to think about the symmetry of a sliced biconvex lens. 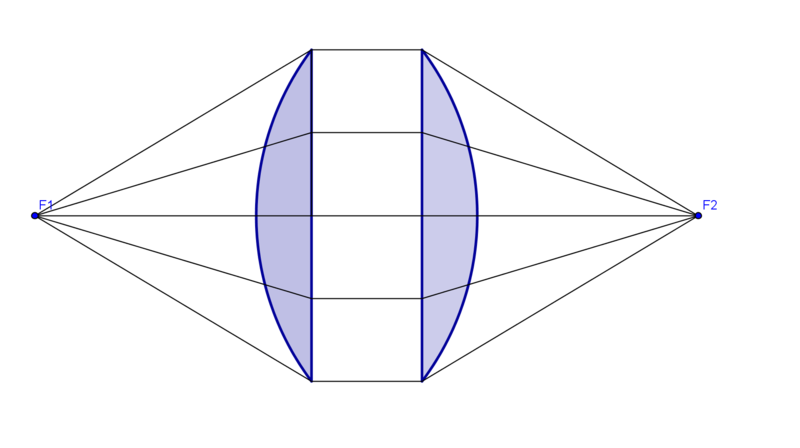 If the biconvex lens can focus light from point F1 to F2, both distance $f$ from the lens, then when you cut the lens in half, each half will have a focal length equal to $f$. The focal length of the biconvex lens is $f/2$. Can calculate the ratio of focal lenghts before and after cutting by doing $R_2\rightarrow\infty$ and $d\rightarrow d/2$. The focal power of the second surface that now is plane will be smaller (actually 0) and, unless this is compensated by a huge decrease in thickness, the lens will have longer focal distance. That's what intuitively seems to happens with the dimensions used in real-life lenses. Not the answer you're looking for? Browse other questions tagged optics lenses or ask your own question. What happens to the index of refraction of a lens if placed in water? How does $1/f$ come out as the intercept when plotting a graph of $1/u$ and $1/v$ in convex lens? What is the actual significance of the focal point of a lens? What happens if we cut a convex lens horizontally?